Unless you’re not a turkey fan, the irrefutable centerpiece on the Thanksgiving table is always the turkey. While it’s supposed to be the pièce de résistance, I’ve unfortunately had far more dry turkeys than succulent ones. Even the juiciest of turkeys still have their undeniable dry spots. The reason is simple, different parts of the bird cook at different rates – it’s like the turkey is setting you up for failure before it’s even in the oven! 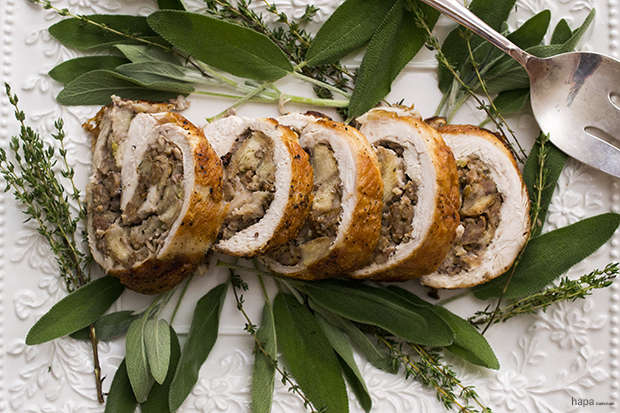 The best way to circumvent this dilemma while still being able to enjoy the tradition of turkey, is to make a Roasted Turkey Roulade! 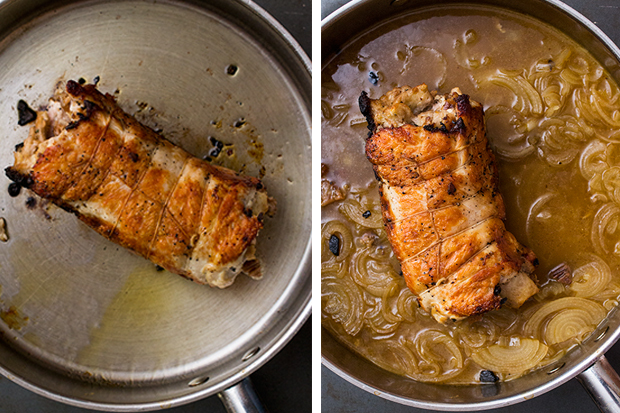 This dish will make you wonder why you haven’t been making it all along. Not only is it mouthwatering and tender, it’s easy to make, a breeze to carve, looks super elegant, cooks quickly, and it can be prepared ahead of time! Simply prep the dressing the night before (I think dressing is always better then next day anyway), roll it up in the turkey, tie it, and refrigerate it. Then all you have to do is cook it on Thanksgiving day. Seriously, what’s not to love!? Oh, and did I mention it’s stuffed with Pork Sausage Dressing? A.k.a – porktastic, bready goodness. The turkey breast needs to be skinned, deboned, and butterflied. If you can’t find it prepared this way or you’re just not comfortable with the prep work, you can ask a butcher at any grocery store to do this for you. Just be sure to tell them you’re making a roulade so they can trim it up as evenly as possible for you. While a roulade is incredibly easy to make, tying the roll can be a bit daunting if you’ve never done it before. Not to worry, it’s actually much easier than it looks and as you become more proficient it will look cleaner and take less time. This is an excellent video tutorial (Tying a Loin) if you need some pointers. 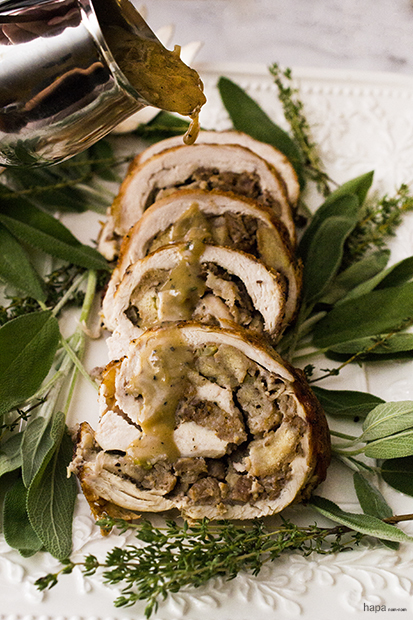 The apple cider vinegar gravy adds a nice tang to the rich flavors of the Pork Sausage Dressing and Turkey Roulade. And like the roulade, it’s super quick and easy to make! 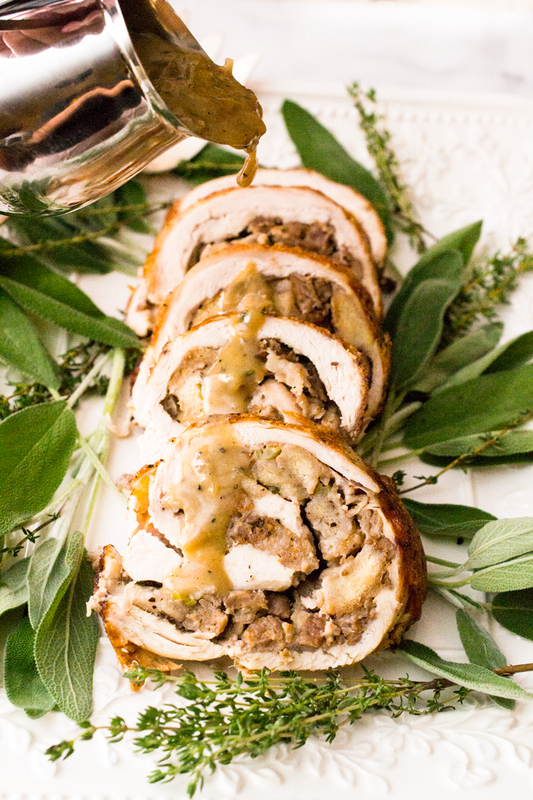 Just think, in about half the time it would take you to cook a whole turkey, you can have an exquisite Roasted Turkey Roulade that will be sure to delight all of your guests. 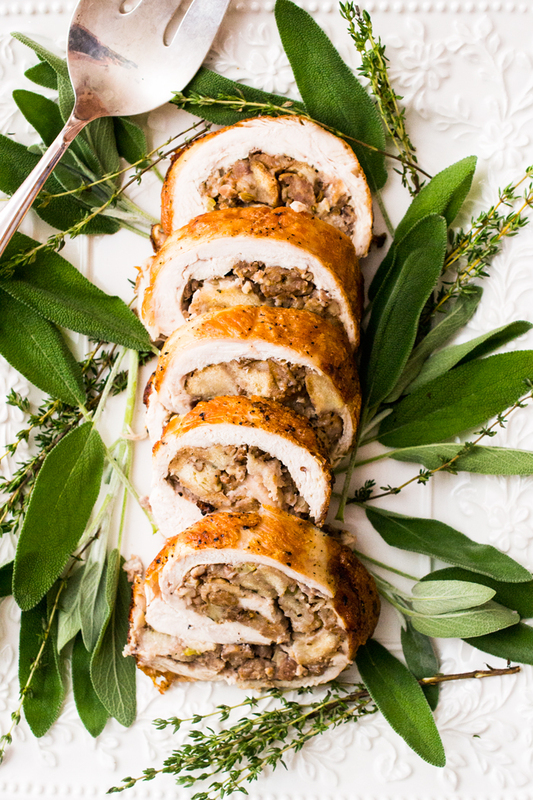 Not only is Roasted Turkey Roulade mouthwatering and tender, it's easy to make, a breeze to carve, looks super elegant, cooks quickly, and it can be prepared ahead of time! Seriously, what's not to love!? Place the turkey between two sheets of plastic wrap and pound flat with a kitchen mallet. Trim any really extraneous pieces. Liberally season both sides of the breast with salt and pepper. Spread the uncooked dressing over the meat (not too thick), leaving a ½-inch boarder on all sides. Starting at the narrowest end, roll the turkey up like a jelly roll, tucking any pieces of dressing that fall out, back into the roll. Secure tightly with kitchen twine. In a dutch oven or other large pan (you want a vessel deep enough to be able to cover the roulade tightly with a lid for roasting), warm the canola oil over medium-high heat. Add the roll, seam side down, and cook for about 2 - 3 minutes per side (assume there's 4 sides), just to brown the outside - don't worry about cooking the inside yet. Sprinkle the onions around the roulade and add 1½ cups of the chicken stock. Cover tightly with a lid and roast in the oven until the internal temperature reaches 160 degrees F (check a few places), about 45 - 60 minutes. Transfer the roll to a cutting board and tent with foil and rest while you make the gravy. Place the pan containing the onions and stock on the stove and add the remaining ½ cup of stock, apple cider vinegar, and bring to a boil. Reduce to a simmer and add the cream, thyme, and salt and pepper. Simmer for 10 minutes. In a separate small bowl, combine the corn starch with 1 tablespoon of water to make a slurry. Add the cornstarch mixture to the pan, stirring constantly until slightly thickened - it should be slightly thicker than an a jus. Cut the twine from the roulade and slice into ½-inch rounds. Plate and serve with the gravy. Enjoy! Hi! I love this recipe! I made it a few years ago and it turned out perfect! The only thing is that I don’t remember if I made one or two at the same time (I really need to write down what I do each year). Should I increase cooking time if I do two at the same time? Hi Natalie. Great question! If you keep the roulades in separate baking vessels or if your vessel is large enough to accommodate both roulades at once with plenty of space between them for air to circulate, then the cook time should only be slightly longer than the time you would need to cook just one; though you should still use a thermometer to check the temperature. This looks so good, Kathleen! It’s so true that the different parts of a turkey cook at totally different rates. I’ve been thinking about trying to confit turkey legs, now I know what to do with the breast! You mention you can prepare this ahead of time. Meaning, the cooked dressing already rolled into the turkey, set aside the day before, and then day of to sear and roast in the oven? I’m very interested in making this for our thanksgiving this year (might end up making two of these) and I wanted to do as much prep the day before so that I am not too overwhelmed day of with other stuff I have to prepare. This is a really fun recipe idea! Who wants to get up at 3:00 am to start roasting a turkey anyway? Pretty sure my mom barely slept the night before Thanksgiving worrying about whether my dad would remember to wake up on time and start the turkey. No joke. This looks way more tasty and delicious anyway. Thanks for sharing! Oh it’s so much less stress than a traditional turkey… and I think it’s tastier too 🙂 I hope you give it a try! I’m looking forward to making this for Thanksgiving! I do not own a dutch oven or roasting pan, do you think a cast iron skillet with a tight foil covering would work? Or is it better to invest in a roasting pan? Thanks!!!! Hi Chrystal! I was visiting my parents when I made this recipe and they did not have a dutch oven – so I improvised. My mom had a very large oven-safe sauté pan with a lid, and that worked great! I recommended using a dutch oven in this recipe for its size, heavy lid, and it’s ability to go in the oven. But if you have another large oven-safe vessel, such as a 6-quart pot with a nicely fitting lid, I suggest using that. You want to keep as much of the moisture in the vessel as possible while it’s cooking. I personally haven’t tried roasting a roulade covered by foil, but I would imagine that if you covered it tightly with foil (making sure the edges around the pan are sealed well) you should get the same effect. I hope this has been helpful! And I hope you and your family have a wonderful Thanksgiving! This looks and sounds so delicious that it’s making my mouth water … and I’ve just had lunch! You are a bit of a queen of winter roast cooking, it seems … That apple cider sauce in particular sounds divine! Thanks, Helen 🙂 The apple cider vinegar sauce is nice because it cuts the fat from the proteins. It is like you read my mind! I have the same issue with turkey re: inevitably dry EVEN if you brine it which makes a huge difference but still, the breast always ends up dry! Turkey truly is so hard to roast. I was planning to post a roulade as part of a Christmas series!! I am so tempted to try yours. Especially with that killer stuffing of yours! I have to make this. I HAVE TO!! Thanks, Nagi! I hope you like it! I can’t wait to see your roulade over Christmas! Wow…so beautiful! I’ve never made a roulade but this sounds delicious! 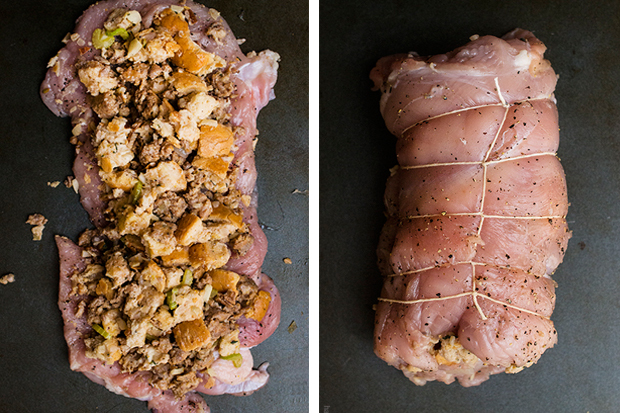 A very nice alternative to roasting a whole turkey. Thanks, Annie! I hope you give it a try – it’s so delicious and easy to make! This looks incredible! And speaking chef-to-chef, nice technique on that roulade! This dish would be perfect with Jolly Pumpkin’s Oro De Calabaza (one of my favorite beers to have with turkey). It’s a biere de grade with sweet malts that complement the roasting of the turkey and pork sausage It has some subtle sourness that would cut the fat of a dish like this but also has some spice notes that will highlight the turkey. Wow! That beer pairing sounds AMAZING! I’ll have to see if I can find that one! Thanks for the tip! This roulade looks just perfect! I agree that roasting a whole turkey is setting you up for a failure, so I usually prefer to cook the breast. 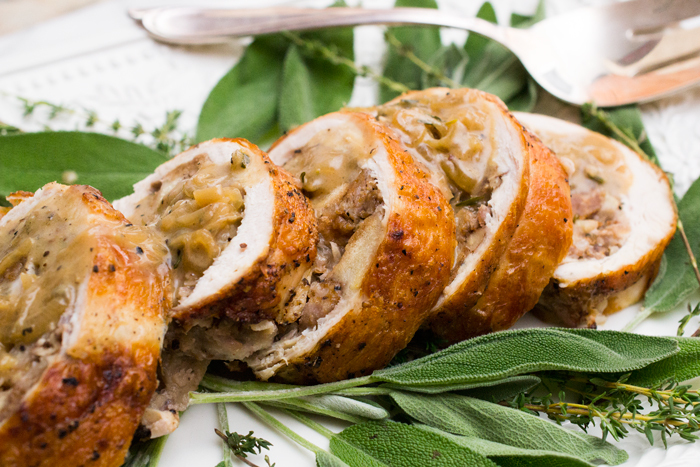 Never made turkey roulade and would love to try it! I love the combination of flavors in this dish and pictures are beautiful! What a lovely alternative to a roast turkey and makes for a beautiful presentation. I really want to try this.